The Cares family—(from left) father George, daughter Sandy, son Paul, son Louie and mother Hope—with business consultant Michael “Stucky” Szczotka. KENTWOOD, Mich. — “It was something I could do,” says George Cares, of launching Sheldon Cleaners, in 1949. During its 66-year history, the company has reinvented itself multiple times; embraced and eliminated revenue streams; and overcome economic and industry-specific hurdles. The business umbrellas the 32,000-square-foot Sheldon Cleaners; 25 satellite locations that are situated in strip malls or on real estate owned by the Cares family; a 6,500-square-foot card-operated vended laundry (The Laundry Café); and a coffee and crêperie inside the laundry (Café Louis). Revenue flows from various income generators, including dry cleaning, self-service laundry, fluff-n-fold, rental income, and food and coffee. In total, the enterprise employs 240 people throughout Grand Rapids, Holland and Kalamazoo, Mich.
George Cares, and his wife, Hope, have five children: Paul, Louie, Sandy, Linda and Martha. 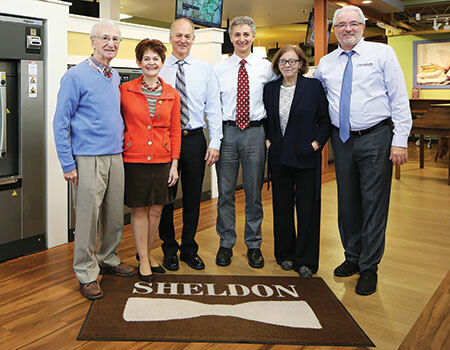 All of them have worked at Sheldon’s front counter over the years. Paul and Louie took over leadership in 2010. George Cares launched the business in 1949 after studying architecture in college and serving in the Navy during World War II. As a child, he had worked in his father’s drycleaning business as a tailor and presser. Being an accomplished tailor, George made tailoring services a critical piece of Sheldon’s services for many years. Not long after opening, the big thoroughfare where the business was located—Sheldon Boulevard—was transformed into a one-way street, according to a 1984 American Drycleaner story. This choked drop-off business, spurring George to look for another revenue generator. George and Hope hopped a train to Chicago. It wasn’t long before George got on a roll buying up small, abandoned gas stations. His first satellite branch, established in 1965, was a renovated Texaco station. Ultimately, he converted 12 gas stations into successful satellite stores. In 1965, George moved Sheldon Cleaners from its 1,400-square-foot plant (which enjoyed $23,000 in annual revenue in 1949) to a 5,000-square-foot plant across the street. By 1980, Sheldon had moved again—this time to its current 26,000-square-foot plant on Brenton Road, in Kentwood. At that time, the business garnered $2 million in annual sales. By 1985, George’s high-volume drycleaning focus spurred him to back off of tailoring. Shortly thereafter, the tuxedo rental business was sold and the Cares family commenced building strip malls. “We did the tuxedos in order to survive early on,” says Louie. “But, by 1991, we realized that the tuxedo rental business took 80% of our effort and generated just 20% of our income.” By comparison, dry cleaning took 20% of the effort but delivered 80% of income. Meanwhile, the newly developed strip malls began flowing retail rental revenue, according to Louie. Some of the strip malls were anchored by Sheldon satellite stores, making it even easier to rent available space within those malls. George, now 90 and retired, stops into Sheldon Cleaners several times a week. It looks a lot different today than it did in 1949. The business eliminated the use of perchloroethylene (perc) in 2006, substituting another solvent that was said to be environmentally friendly and Environmental Protection Agency (EPA)-approved but was hard on machinery, according to Paul. That’s when they turned to Michael “Stucky” Szczotka, who had sold them a few Continental Girbau soft-mount washers through the years. The Cares brothers were thinking hard about getting into different industries. As the owner of Carrington Cleaners, a dry cleaner in Washington Township, Mich.; CRDN of Southern Nevada; and Eagle Star Equipment, a commercial laundry and drycleaning equipment distributor in Troy, Mich., Szczotka knows dry cleaning and laundry. He also knows the vended laundry business, as owner of New Wave Laundromat, in Sterling Heights, Mich.
“He came in and pumped new life into Sheldon,” says Paul. A complete plant overhaul commenced that resulted in huge throughput gains and labor and energy savings, according to the Careses. 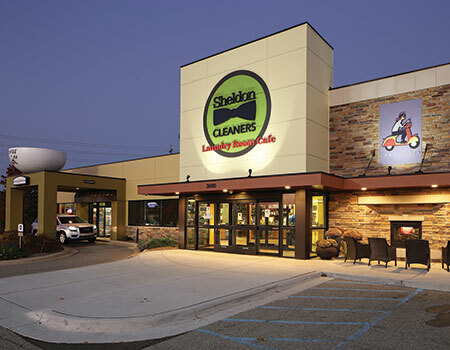 By driving operational and energy costs down, Sheldon Cleaners gains profitability. “We are projecting a 10-15% elevation in profit,” says Paul. All told, Sheldon Cleaners is more productive, efficient, green and profitable than ever, according to the Cares brothers. Plus, it occupies a 20% smaller footprint. Focused on ways to produce additional revenue from that extra space, the brothers turned to Szczotka with their idea of developing a 6,500-square-foot, high-speed vended laundry and café.